Aviation Updates Philippines - Gokongwei-led low-cost airline Cebu Pacific Air eyes to launch initial Airbus A321-200ceo operation starting second quarter of 2018. HIGHER PASSENGER VOLUME. 50 more passengers will be able to fit into Cebu Pacific's new A321 aircraft. This is compared to the airline's 180-seat Airbus A320 aircraft. 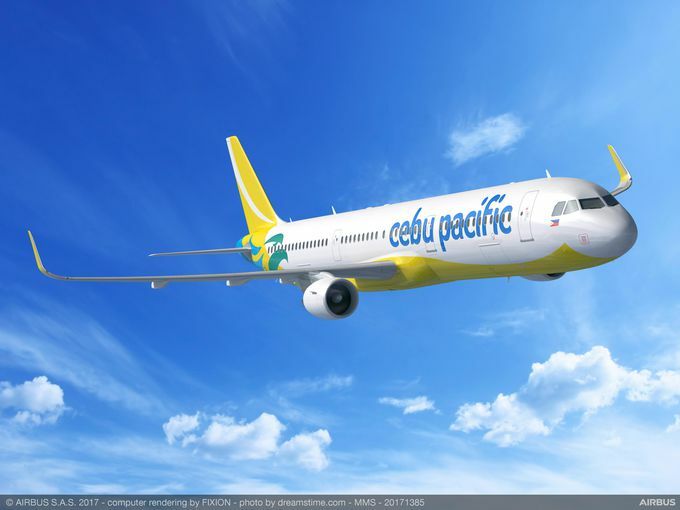 Based from reports gathered by AirlineRoute.net, Cebu Pacific will be deploying its 230-seat Airbus A321-200 aircraft to domestic and international destinations with high passenger demand. This move will positively affect the airline's passenger volume and profit. Starting April 1, Cebu Pacific will be launching its first A321 services to Cebu and Iloilo, both flying two times daily initially, and General Santos (service increases to two daily starting May) with once a day service. A321 operation will be expanded as it accepts more of the aircraft starting first day of May with services to Bacolod, Cagayan de Oro, Davao (service increases by three daily flights starting June), Hong Kong, and Zamboanga, all flying once daily. Puerto Princesa will also be added in May but will only be flown six times a week. Manila to Shanghai sector will be upgraded to A321 from the current A320 service starting June 1, flying daily. Taipei will receive once a day A321 flight starting June 16. The low-cost airline placed an order for seven Airbus A321-200ceo aircraft in June last year. It is expected to be delivered in March 2018. That is on top of its current order for 32 Airbus A321neo aircraft which are continuously facing delays due to engine production problems. The A321neo aircraft are expected to be delivered from the fourth quarter of 2018 up to 2022. The addition of A321ceo into Cebu Pacific's fleet will enable the airline to carry more passengers in one single flight. This may cost savings and may ease slot restrictions at the Ninoy Aquino International Airport.